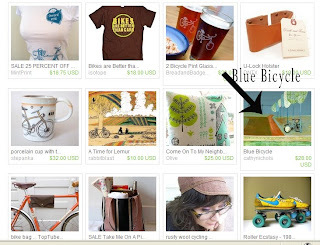 I know this is shameless, but I am happy to annouce that my "Blue Bicycle" print is presently featured in one of ETSY's gift guides -- a lovely collection called "Alfresco" that includes lots of really cool stuff about the outdoors. Ordinarily I might gloss over this little happy piece of PR, but I haven't had much time to paint since returning from Jamaica, and this tidbit brightens my spirits. It was quite a shock to the system to return to two babies and one 6-year old stepdaughter after 6 days of lying on the beach blissfully listening to Bob Marley and waving a red flag for more drinks. Sigh. "Surfer Girl" 8x10 mixed media on wood panel. Original is sold, but prints are available here on ETSY. Finally -- a surfer GIRL! I have wanted to create this piece for a long time, and am very happy with the interesting way the collaged parts fell together. 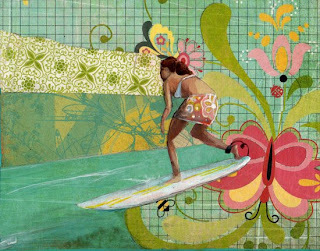 I was contemplating just painting her on a regular wave, but then I saw this very groovy piece of paper and just had to poise her catching a wave on an unfolding butterly flower.